But remember to check use-by dates on all medicines, and make sure they are properly stored and out of reach of children. Common ailments such as colds, sore throats and coughs can often be effectively treated at home. Pharmacists have a wealth of knowledge in how to treat these types of illness and a local pharmacy may help. It is also important to make sure your medicine cabinet at home is well stocked and contains sufficient over-the-counter medicines to treat minor ailments. If you need medical advice quickly, call NHS 111. Available 24 hours a day, 7 days a week, when you call NHS 111 you will be assessed, given advice and directed to the local service that can best meet your needs. A local extended hours and out-of-hours GP service is available for illnesses and injuries that cannot wait until GP Practices reopen after Easter.. 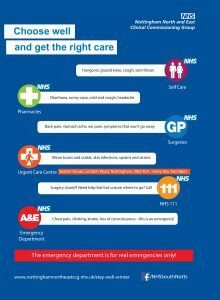 Remember the Emergency Department is for emergencies only!